Tavernier, FL – February 7, 2019 – This year marked the 30th anniversary of the Mariners Hospital Bougainvillea Ball. For over 15 years, Caribee Boat Sales & Marina has donated a boat for a raffle to raise funds for the hospital. 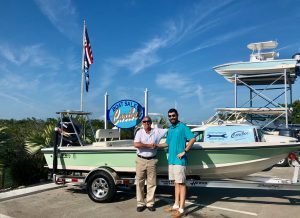 This year’s winner, Michael Thaler, is the proud new owner of a 2019 18-foot Hewes Redfisher with a Yamaha VF-115LA 4-stroke high performance outboard motor, complete with an AmeraTrail custom trailer. Mr. Thaler is so grateful that he has offered to donate all the wine for the Mariners Hospital Bougainvillea Ball in 2020. His wife, Esther, owns Martinis Fine Wine & Spirits in Islamorada. Mariners Hospital is grateful to Caribee Boat Sales & Marina, as well as all of the generous donors who made this year’s event such a success. Mariners Hospital is part of Baptist Health South Florida, the largest healthcare organization in the region, with 10 hospitals (Baptist Hospital, Baptist Children’s Hospital, Bethesda Hospital East, Bethesda Hospital West, Doctors Hospital, Fishermen’s Community Hospital, Homestead Hospital, Mariners Hospital, South Miami Hospital and West Kendall Baptist Hospital), more than 40 physician practices, 50 outpatient and urgent care facilities, Baptist Health Medical Group, Baptist Health Quality Network and internationally renowned centers of excellence spanning across Monroe, Miami-Dade, Broward and Palm Beach counties. A not-for-profit organization supported by philanthropy and committed to our faith-based charitable mission of medical excellence, Baptist Health has more than 19,500 employees and more than 3,000 affiliated physicians. Baptist Health South Florida has been recognized by Fortune as one of the 100 Best Companies to Work For in America and by Ethisphere as one of the World’s Most Ethical Companies. For more information, visit BaptistHealth.net/newsroom and connect with us on Facebook at facebook.com/BaptistHealthSF and on Twitter and Instagram @BaptistHealthSF.